Edmonton rock band, Tupelo Honey, recently released a new album, Brave New World, which debuted at #7 on the Canadian iTunes Rock Chart. Tupelo Honey’s music video for the debut single off Brave New World, “Halo,” was added to heavy rotation and the Top 20 Countdown on MuchMusic and was additionally featured in the Cineplex pre-show nation-wide this past February. In support of their new album, Tupelo Honey will perform a showcase next week at Canadian Music Week in Toronto. They will playing at the Underground Garage on May 9, 2014. In celebration of their upcoming Canadian Music Week show, we are giving away an exclusive Tupelo Honey CMW Mega Prizepack to one lucky fan! Contest closes May 5th, 2014 at noon, EST. Courtesy of Strut Entertainment & CMW. Wristbands and indie tickets will be available for pick up from May 6 at The CMW Box office, which is located at the Toronto Marriott Downtown Eaton Centre Hotel. Winners will need to present ID and must be 19+. Copy of the signed album from their show can be picked up during the meet and greet. Winners are responsible for their own transportation to/from events. *Alternate/Bonus Entry Method*: Tweet “Hey @IntoTheCrowdMag, I want to score #CMW wristbands and meet @TupeloHoneyBand http://wp.me/p2L82O-1mH” for an extra entry! 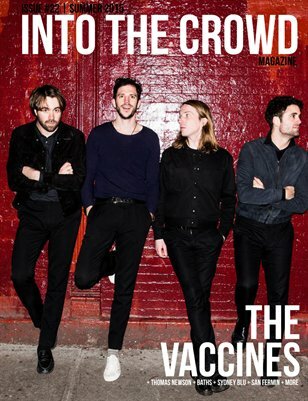 Bonus alternative entry: Tweet “Hey @IntoTheCrowdMag, I want to score #CMW wristbands and meet @TupeloHoneyBand http://wp.me/p2L82O-1mH” for an extra entry!